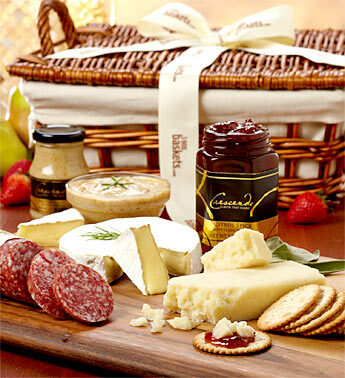 Make a grand gesture in gourmet food gift giving. They’ll love San Francisco-crafted Columbus® classic Italian salame that is hand-tied, and American-made farm fresh premium cheeses like Rouge et Noir® Original Brie Cheese and Sierra Nevada Aged Goat Cheddar Cheese. Pair these exceptional cheeses with snacks like a citrus spice appetizer spread, sweet & spicy mustard dip and premium water crackers and it’s enough to make a foodie weep tears of joy. Artistically designed in a covered willow basket with a fabric liner San Francisco-crafted Columbus® classic Italian salame Rouge et Noir® Original Brie Cheese Sierra Nevada Aged Goat Cheddar Cheese Columbus® Italian Dry Salame Citrus Spice Appetizer Spread Sweet & Spicy Mustard Water Crackers Measures 7”Hx11 ½”Wx13 ½”L This gift includes exceptionally fresh cheese and requires Overnight delivery.